When Congress returns next month, it will once again have to wrestle with the issue of raising the federal debt ceiling or face the possibility of a government shutdown and a default on America’s debt obligations. And, again, the prospect of a partisan stalemate is looming, as is a repeat of the drawn-out fight over the debt ceiling that occurred in the summer of 2011. The result represented a political low point for Congress, and especially for Republicans. 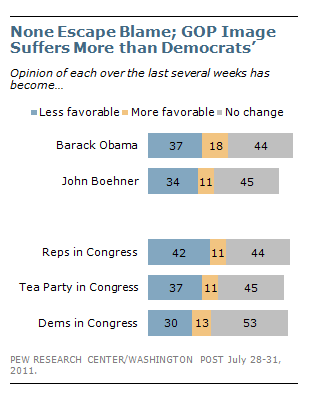 In a survey conducted in mid-August 2011, shortly after a deal was finally reached, the number of Americans saying they had a favorable view of Congress fell to 25%, down 9 percentage points from the previous March. That was among the lowest favorable ratings for Congress in more than two decades of Pew Research Center surveys, (although that rating has since fallen lower – to 21% — as of this July). The July 2011 survey found that the debt ceiling debate had “tarnished the image of both President Obama and Speaker (John) Boehner,” with about a third saying they had formed a less favorable view of the pair in the preceding weeks. When it came to the parties in Congress, 42% said their impression of Republicans had become less favorable as a result of the negotiations, compared with 30% who said that of the Democrats.